Mary came and got me a week or so ago and told me to come with her right away. She wouldn't tell me what was wrong, she kept telling me to come with her now. My heart was in my throat. She led me into the back hall and down into the basement. At the foot of the stairs, she turned and pointed to the area in front of the dryer. There, on the concrete footing that the dryer is perched on was a motionless mouse. Just lying there. Very still. A quick examination confirmed my worst thoughts: the mouse was dead. Where did he come from? Why hadn't I heard him? Who was responsible for the death? It looked like a case for CSI: Sturbridge. A year, or so, ago I found some other mouse bodies in the basement. Could there be a serial killer in the house? The last batch of mice were dispatched with the help of D-Con, however this guy expired long after the D-Con was gone. Old age? Was he ill? An overdose? Or, was it foul play? All these questions were running through my head. Soon, I began to hear muffled words that were getting clearer and more pronounced, "Take him away! Wally, get rid of the mouse!" Mary was standing behind me offering directions. I picked up the mouse by the tail, and brought him out into the back yard and disposed of the body. Mary thanked me, and I washed my hands. The fall usually brings these little guys indoors. Warm and snug, they usually have a source of food as well. What is interesting is in the weeks prior to the discovery of the body, our cats were acting a bit peculiar. I first noticed them going to a corner of the living room and sniffing around the baseboard, then standing up with their paws on the wall. Strange. Next, they would gather on top of the washing machine, which is in the first floor bathroom, and stare at the walls, and often to the same stand-up-and-touch-the-wall thing I had witnessed in the living room. They heard something in those walls. They knew we had visitors, but did they let us know? No. Not even a note. To tell you the truth, I think they are all in cahoots. Where there is one mouse, there are usually more mice. One single female mouse can have up to two trillion offspring in a six month period, so it was off to Wal*Mart for some "mouse food". Now, don't get all Green Peace on me. It has to be done. There is no way one can reason with a rodent. Remember the Red Squirrels? And, catching them alive and transplanting them elsewhere will do little good since I would be playing catch and release for years to come. No, I had to stop the mice in their little mouse tracks. The cats aren't allowed in the basement since there may be remnants of the previous "mouse food" in the nooks and crannies, so they would be little good in eradicating our problem. They can do what they will with any stragglers that show their faces upstairs, but the basement is off limits. Cats are neat when it comes to catching mice, though. They often leave their catch at the feet of their owner as if to say, "There. All set. I got him. Now, give me a treat." I hope they don't catch one upstairs and deliver it to Mary when I am not there. She would not do well sitting in the chandelier till I came home. I left one of the "mouse snacks" in the basement above the dryer in a crawl space. The following day I examined it and found it had been nibbled at. There were distinctive teeth marks on the "food". The next day, more of it was gone, with more teeth marks. Soon, these interlopers will be no more. I don't like to think of what happens to them after they have had their fill. I think the "mouse food" package said something about them dissolving into thin air never to be seen again. Yeah. That's what it said. Amazing product. So, life amongst the fauna here on Brookfield Road in Fiskdale continues. From salamanders to deer to coyotes, squirrels, chipmunks, and now, mice. I should be on Animal Planet. I do have a fear, though. 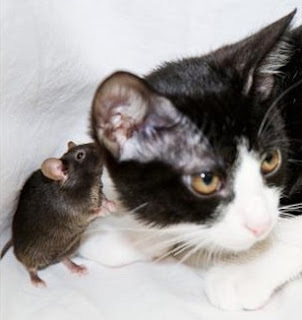 See, when I was living in a little house I rented before we bought this old house, I had my first run in with mice. I set up a conventional mouse trap on the kitchen counter, and nailed two of them on consecutive nights. Their family never showed up inside my place again, but my 2000 Chrysler Sebring that I had parked in the yard after buying the truck was never the same. They go their revenge by sneaking into heating system and building nests, then filling them with hundreds of acorns. Yep, the car was never the same after that. Mouse fur, and acorn pieces would fly out of the vent whenever I turned on the heat and set the fan on high. I could hear them giggling from deep inside the dashboard. So, if you don't see anything new posted on this blog for a week or more, you can assume I've been "taken care of" by the survivors. Little four legged fur balls dressed in black suits with little white ties have put a contract out on me. Please send Mary a sympathy card, and maybe, some more D-Con. Above photo: Actual photo taken of one of our cats plotting with one of the mice. Help. The next morning, from inside the closet, my husband cut a hole on that partition wall, reached in and pulled out a handful of mouse bodies in different stages of decomp, along with the live one of course - which he dropped and had to chase - with a knife in his hand. It looked like a scene out of some horror flick. We ended up replacing that wall I told you about, along with two others, along with the entire ceiling in the master bedroom because it was saturated with mouse pee, all the ceiling insulation because they had tunneled through it, and even the wiring they chewed...it's dangerous and stinky, too. Stop laughing now, and listen: mice use scent (urine) trails and they're generational trails. As you say: if you have one, you have many more. They can fit through a hole the size of a dime, and can actually cave their heads in to squeeze through. Our cat hunts the mice in our house, because though we've plugged up as many holes as we could, they still find their way in. So she chases them up to our master bedroom at 2 am, and then my husband joins in the hunt...lights on! Naked man and cat running around the bedroom! Go check you're attic and look for daylight shining through. Mortar your basement walls (Mary will help you, I'm sure!). Whatever you do, don't use those adhesive traps that mouse feet stick to. Those are more inhumane than D-Con. D-Con works well, but sometimes, they die inside your house, like the one that crawled under my refrigerator a few weeks ago and died. My kitchen stunk for weeks, and the way they make refrigerators these days, I could not get to that corpse! I didn't cook, or eat, in that kitchen for two weeks. And it's still there, always will be until that refrigerator dies. Your cats are talking to you; you need to pay attention and listen better! Check out your attic - pull back the insulation and have a look, and put some D-Con up there too!